Dating and body image are often topics which come hand in hand. It’s a cliche, but unless you love yourself, it’s very hard to let someone else love you. Recently I wrote about dating a 21 year-old, and my memories of 21 year-old me. If anything it made me realise just how long it took for me to become truly comfortable in my own skin. But what happens if that ‘own skin’ feels dramatically different to everyone around you? How do you go on a first date to a restaurant if your visual impairment means you can’t read the menu? At what point in a relationship do you tell someone that under your trousers, you’re also wearing prosthetic legs? And is missing a limb, or being in a wheelchair, something you ought to share on your dating profile? 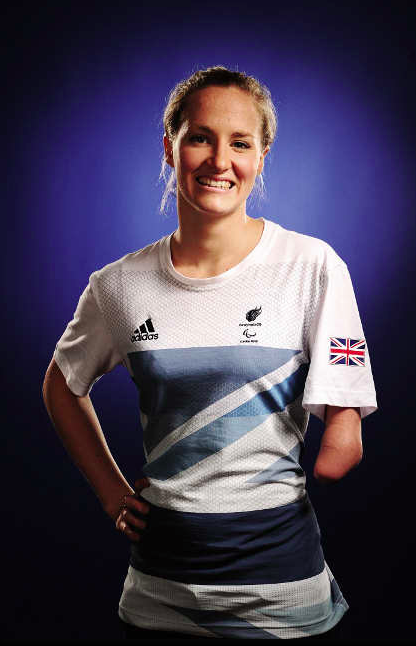 I spoke to triple Paralympic silver and bronze medalist Claire Cashmore, about her personal experiences growing up with a disability, and how it has affected the way in which she dated. Claire is twenty-five years old. At the start of last summer she was one of a number of British paralympians who Channel Four dubbed ‘Superhuman’, and having spoken to her in person, it’s easy to see why! Claire was born with no lower left arm. No one knows why she was born missing part of her limb, though she has been known to tell people it was due to a shark attack! 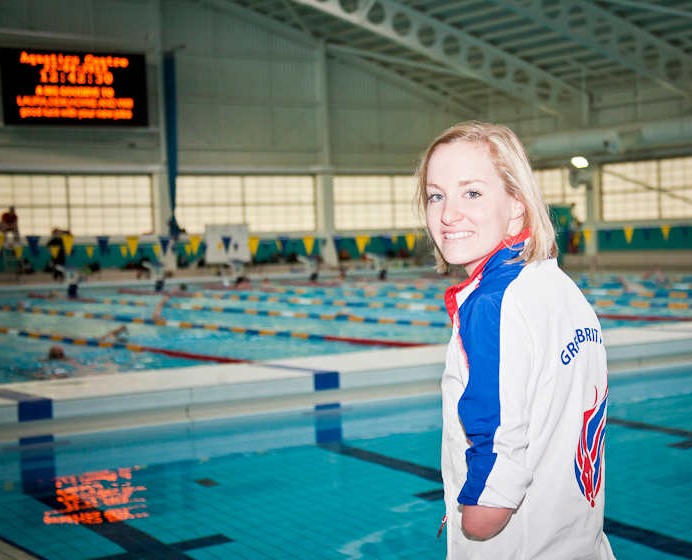 The condition is known as ‘Amelia’ (which literally means the ‘lack of a limb’) or more specifically ‘Upper Limb Deficiency’, and on account of her missing forearm, when Claire competes, she swims in the S8 and S9 classes. 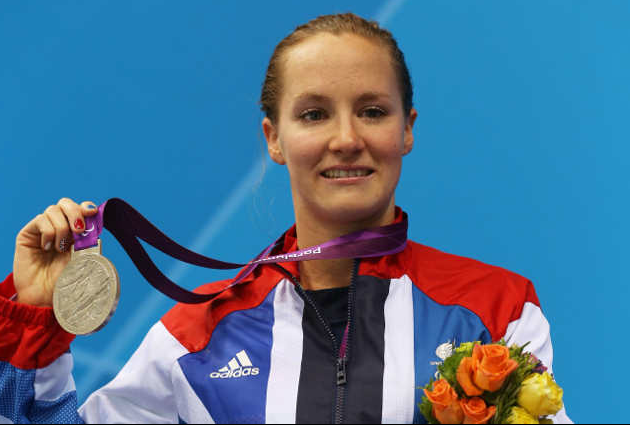 At the London 2012 Paralympics, Claire won Silver in the 100m SB8 Breaststroke, Bronze in the 4 x 100m Freestyle Relay (34 points), and Silver in the nail-biting final of the 4 x 100m Medley Relay (34 points), where the British girls finished just 0.03 seconds behind their Australian rivals. Outside of the pool, Claire graduated from Leeds University in 2011, and works as an ambassador for the charity REACH. 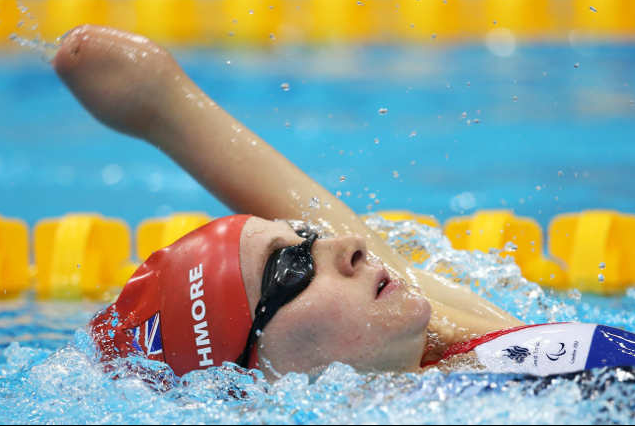 She is an athlete mentor for the Youth Sport Trust – an organisation which uses sport as a vehicle to inspire young people in life, and is an athlete rep for British Disability Swimming. She’s been dating her boyfriend for the past five years, and enjoys shopping, cinema, theatre, cooking and spending time with friends and family. Growing up Claire described herself as a ‘very determined little girl’. According to her mum, she learnt how to do things like tie her shoe-laces far quicker than her two older sisters. Apart from monkey bars, which remain a lifelong challenge (something she says with a big grin on her face! ), there was nothing she couldn’t do as a child. Though she used to pretend she couldn’t peel oranges, just so she didn’t have to get messy! No one else in Claire’s family or primary school was disabled, and it wasn’t until she was twelve and began swimming in disabled competitions that she first made friends with other disabled children. She can still remember turning up to her first competition, and being daunted by all the disabilities around her. One of her closest friends from swimming also only has one arm, and at first Claire found it funny watching her friend do thinks like tie her hair, or clap, completely forgetting that she looked the exact same herself! As a teenager, Claire’s disability affected her massively. She would wrap a scarf around her stump, and never remove her jumper or blazer, making hot summer days unnecessarily unpleasant. The start of the school year was always the most difficult, as Claire always felt like the new Year Seven class was staring at her. However swimming helped Claire come to terms with her body, because being in a swimming costume meant there was nowhere Claire could hide her arm. Meeting others who didn’t care about their disability also helped Claire change her own attitude Finally, when she turned sixteen, and started a new school, just after competing in her first Paralympic Games in 2004, Claire decided to stop covering up her arm, and let people accept her for who she was. If they didn’t like it, she realised they weren’t worth knowing anyway! Having friends with similar disabilities also meant she had people to talk to who understood specific issues or problems she was having which her other friends couldn’t necessarily grasp. As Claire grew older, her attitude to other peoples’ disabilities also changed. Now, she often forgets what is wrong with people, and simply sees them as a person, rather than someone with a disability. She gives examples of stepping on a friend’s foot and apologising, completely forgetting that her friend wears prostetic legs. In turn, her friends often forget her arm, asking her whether she’s left or right-handed, or which hand she wears her watch on. Whilst missing part of a limb may seem like a very obvious disability, often people take some time to notice. At University, one of Claire’s housemates took two weeks to realise she didn’t have a left hand, something which also proved rather awkward during a Freshers Week game of ‘Ring of Fire’. Someone introduced a rule that those playing could only use their left hands. As Claire continued to drink with her right, someone tried to ‘fine’ her, only for her to raise both her hand and her stump up in the air. Whilst Claire though it was hilarious, the rest of the room fell silent, and she spent most of the rest of the night being apologised to! A few years on, and the group are some of her closest friends. When I asked her how her disability affected the way she dated, Claire admitted that as a teenager she used to think she would never meet anyone. ‘Why would someone choose me over my really pretty friends who have two arms?’ It was tough, because her able-bodied friends (an interesting choice of phrase when you realise none of them have won international sports medals!) could never properly understand. They would tell her what an amazing, beautiful person she was, and that guys would love her for who she was, but Claire’s experiences had made her feel anything but. She remembers dancing with a guy in a club, only to hear him remark to his friends afterwards ‘OMG I just danced with a one-armed chick!’, and she once had a guy tell her that her arm made him feel sick. Off-hand comments which have stayed with her for life, and at the time made her feel like a freak. As a result, Claire would only ever date guys who already knew about her disability. The hurdle of explaining about her arm was just too big. But, much like anyone growing up, the biggest change Claire attributes to her attitude to dating, and to meeting people, is self-confidence. Claire’s confidence and how comfortable she is with her disability makes other people feel more at ease, and more willing to ask questions. Rather then being an elephant in the room, it has become something which her friends take the mickey out of – a sign of just how comfortable they too are with her disability. To be honest, when I first started writing this article, I almost went to change the opening sentence, realising how ironic the phrase ‘hand in hand’ might seem, given Claire’s disability. But one of the biggest issues people with disabilities face these days, is people tip-toeing around the issues, and treating them differently. And the only way disability can become mainstream and ‘normal’ is if we treat people with disabilities the exact same way we do everyone else. People often ask Claire, whether she would grow her arm back, if she could, and her answer is ‘100% No!’ She loves her life, and she’s had so many opportunities because of her arm. It has shaped the person she is today, and her entire life. Claire is happily in a relationship, with a boyfriend who she met through swimming. He was a friend first, and so she never had to face the awkward ‘ummm I actually only have one arm’ conversation. Claire’s boyfriend is also disabled – he became visually impaired at seventeen – and Claire has noticed that a lot of her disabled friends are also in relationships with others with disability. Obviously if you are heavily involved in disabled sporting competitions, you’re constantly surrounded by others with disability, and so it’s more likely that you will find a partner in that circle, however the element of empathy, and understanding the challenges the other person faces is also something which can help unite people. But not every disabled person thinks the way Claire does. And not every disabled person is as confident in their own skin as she is. It has taken years for Claire to become comfortable with her own body, and with peoples’ reactions to it. And one of the reasons why she is so comfortable with it, is the sporting success she has enjoyed because of it. Not every disabled person has a trophy cabinet full of Paralympic Medals, and World and European titles. Claire has a lot of single disabled friends, and she acknowledges that most of her single disabled friends are girls, though she’s unsure whether this is because they are more picky about who they date, or simply because guys can be less accepting of disabilities than girls can. Whilst you can never generalise about why people are single, a big part of finding a partner is self-confidence, and as Claire knows from her younger years, disability can affect that a lot. She uses the same cliche as me – ‘if you can’t love yourself, then other people can’t love you either’. It’s interesting to hear someone who is completely confident and happy in her own disability saying that. Even she doesn’t have all the answers – and as she admits herself, she ended up dating someone who is also disabled, and who she already knew as a friend, so these are issues she’s never had to deal with herself. As part of the 30 Dating Experiment with Disability, I’m hoping to recruit at least one Experimental Dater with a Disability … and if possible more than one, so that these are issues they can explore on the blog. If you’re disabled, is it easier to date someone else with a disability? Should it be? If you’re disabled and online dating, what happens if you include your disability in your profile? And do you have better luck with guys if you don’t? Or are the dates just a lot more awkward. I finished the interview by asking Claire what advice she would give someone who is single and disabled. It doesn’t take much to see why the nation dubbed her ‘Superhuman’ last year, and she should be an inspiration to us all – not just those of you who are disabled and reading this blog, but anyone who is doubting themselves. On behalf of the 30 Dates Blog, I would like to thank Claire for her time, and her inspiration, and wish her all the best in her campaign for that elusive Paralympic Gold Medal at Rio in 2016!